Expand to 21 photos (4 cars) found with exterior color of "caribbean coral"
(from page 56 of the 1968 Collection) This is a 1968 Mustang hardtop with special order paint Caribbean Coral (WT9012) which was used in two 1968 promotions. This color was called Eastertime Coral for the April Color of the Month promotion, and it was called Caribbean Coral for the 1968 to 1969 west coast Rainbow of Colors promotion. The Rainbow of Colors promotion allowed new Mustang owners a discount on sport options and one of 13 special order paint colors. 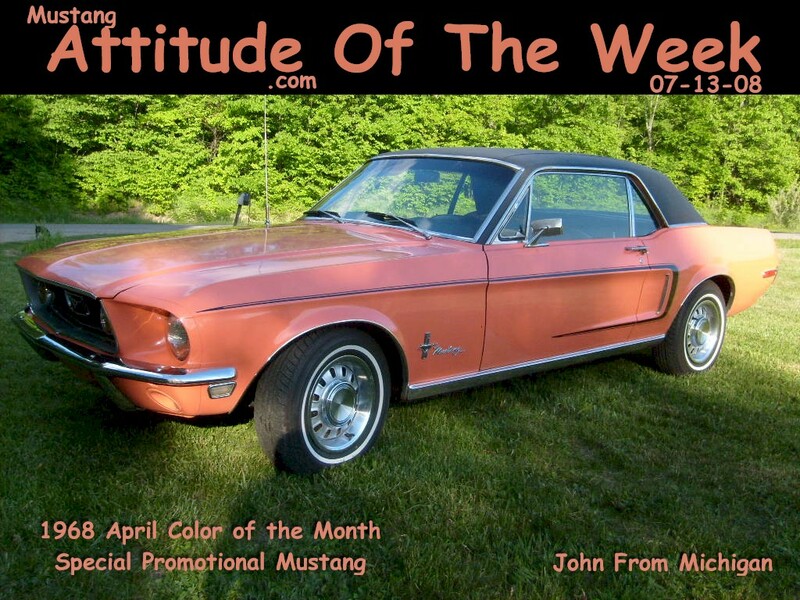 (from page 56 of the 1968 Collection) Special order Caribbean Coral 1968 Rainbow of Colors promotional Mustang with black vinyl roof and aftermarket GT sport wheels. The non-GT version of these optional wheels were commonly included in the Rainbow of Colors promotion, as was the vinyl roof, and louvered hood. (from page 56 of the 1968 Collection) Rainbow of Colors promotional 1968 Mustang with special order Caribbean Coral paint and C-code 289 cubic inch V8 engine connected to its dual exhaust. The chrome door edge guards were both a factory and a dealer installed option. (from page 56 of the 1968 Collection) Even though this car has been repainted, it is a pretty good match to its original color. Check out the color under the carpet in the trunk (last photo of this set) or other Caribbean Coral Mustangs on this site. (from page 56 of the 1968 Collection) Right side view of a Caribbean Coral, Rainbow of Colors promotional, 289ci V8, Mustang hardtop. (from page 56 of the 1968 Collection) Another awesome view of this special Caribbean Coral Mustang hardtop.